Gavin I. Langmuir's work on the formation and nature of antisemitism has earned him an international reputation. In History, Religion, and Antisemitism he bravely confronts the problems that arise when historians have to describe and explain religious phenomena, as any historian of antisemitism must. How, and to what extent, can the historian be objective? Is it possible to discuss Christian attitudes toward Jews, for example, without adopting the historical explanations of those whose thoughts and actions one is discussing? What, exactly, does the historian mean by "religion" or "religious"? Langmuir's original and stimulating responses to these questions reflect his inquiry into the approaches of anthropology, sociology, and psychology and into recent empirical research on the functioning of the mind and the nature of thought. His distinction between religiosity, a property of individuals, and religion, a social phenomenon, allows him to place unusual emphasis on the role of religious doubts and tensions and the irrationality they can produce. Defining antisemitism as irrational beliefs about Jews, he distinguishes Christian anti-Judaism from Christian antisemitism, demonstrates that antisemitism emerged in the twelfth and thirteenth centuries because of rising Christian doubts, and sketches how the revolutionary changes in religion and mentality in the modern period brought new faiths, new kinds of religious doubt, and a deadlier expression of antisemitism. 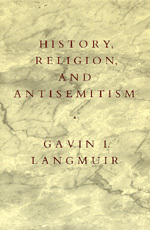 Although he developed it in dealing with the difficult question of antisemitism, Langmuir's approach to religious history is important for historians in all areas.